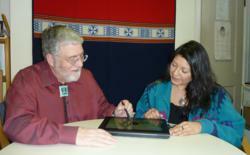 The J3500 Tablet PC is the ideal solution and fully supports my work with Native communities. Dr. R. Dale Walker, from the Cherokee Tribe of Oklahoma, is a professor of Psychiatry, Public Health and Preventive Medicine as well as the director of the Center for American Indian Education and Research at Oregon Health and Science University and director of the One Sky Center. With a mission of improving the prevention and treatment of mental health and substance abuse problems and services among Native people, Dr. Walker averages approximately 50 site visits per year, during which he uses the Motion® J3500 Tablet PC to gather enormous amounts of information, such as the tribe’s history, activities, current state, problems and problem-solving methods. According to Dr. Walker, using the J3500 Tablet PC is just like taking notes on paper, but much more efficient. An hour’s worth of notes can be converted to text and emailed out in just minutes. “The ability to capture information, report back on my findings and share knowledge in near real time is an invaluable capability,” said Dr. Walker. The tablet serves as a desktop replacement or portable library, helping Dr. Walker look up, verify or access educational tools on the fly, which proves extremely valuable considering the often remote locations of the communities. The access to information also reduces the amount of time spent on each subject, meaning more time to cover more topics. “It’s giving them the gift of information,” said Dr. Walker. Looking forward, Dr. Walker hopes to use the J3500 Tablet PC to help develop community surveys to expedite the flow of information as well as understanding of trends in Native communities. Created in 2003, the One Sky Center is the first American Indian/Alaska Native national resource center for substance abuse and mental health services and is located at Oregon Health & Science University in Portland, Oregon. With visits to reservations and urban programs throughout North America, the One Sky Center is the only national program that works directly with Indian communities and tribes to provide technical assistance, consultation and training activities. The One Sky Center also works with a broader audience of federal, state, local and tribal governments, in addition to the private sector, regarding Indian affairs, tribal trust education and healthcare.